Apple quietly introduced an update to Garageband that adds a cool new feature: iPhone ringtone creation. Anything you’ve got in Garageband, you can turn into a ringtone. For some people, that may mean the end of getting double-charged for ringtones at iTunes. If you’re a musician or if you’ve got a podcast, though, you might want to create ringtones to promote your song or show. You could do this with your music, a show theme, sound effects or a catchphrase. Open your Garageband file, turn on the “Cycle region” button, and then adjust your the sides of the selection to get the audio you want. You can preview the ringtone by pressing the “Play” button. That’s it. Your selection should be under 40 seconds long. Once the cycle area has been set, choose Share > Send Ringtone to iTunes. Your custom ringtone will show up in iTunes. Give it a preview, and then you can sync it to your iPhone! If you want to make a ringtone out of an existing piece of audio, like an .mp3 file, create a new Garageband file and drag your audio in, and then follow the instructions above. You can find your ringtone on your computer from iTunes. 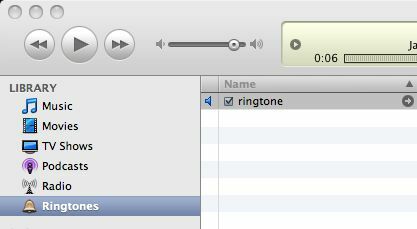 CTRL-click on your ringtone and select Show in Finder.